This weeks topic: Take some of your favourite characters and hook them up with characters from different books. 5. Patch (Hush, Hush) and Lilly Moscowitz (from The Princess Diaries). This match is for entertainment purposes. Can you imagine Patch trying to seduce Lilly? Patch: (leaning in, lowering his voice): Shower. Naked. I know the drill. Lilly: (disgustedly) Patch, grow up! And, must you constantly breathe on me? Lilly would so stuff up Patch's plans... :) Bring it on! 4. Katsa (Graceling) and Alex Fuentes (Perfect Chemistry). All right, I just want to see what would go down with Alex and the famously feminist Katsa. Katsa: (offended) Perhaps I can stay by the fire and mend your socks and scream if I hear any strange noises. Alex: Que mierdo! (grinning) Mamachita, whatever gets you going. Or Miranda (Life As We Knew It) who so needs a little romance in her life. And Peeta would know just how to look after her and help her survive the apocalypse. Patrick is the exact kind of Bad Boy idiot who is tough enough to put up with Parker, yet cool enough to help her see the lighter side of life.And Parker can give back as good as Patrick gives :) I'd love to see the two of them, sparks flying... I want to read that book. They even have the alliteration thing down. Oh - and Peeta was hard? If he doesn't get Katniss, who would like to see him with? Here's Catching Fire, book #2 in Suzanne Collins' Hunger Games trilogy. This one doesn't look any better in the flesh. What is with the purple and white? I don't get it, all foggy and symmetrical. Someone, enlighten me. I wish they'd had Jason Chan illustrate something for this that would go with #1. I like the mockingjay bird, looks pretty funky up close and orange is vibrant and, ah, so orange. Way more appealing than their #1. I heart this. Such a perfect match to #1. How cool are the jaggedy leaves and glistening rain drops? but, ah, it's in red. I'm crushing on Germany's and Taiwan and I think the US has a good thing going down. Road Trip Wednesday is a blog carnival courtesy of YA Highway who post a writing- or reading-related prompt for all the YA bloggers to participate in. What’s the best book you read in July? 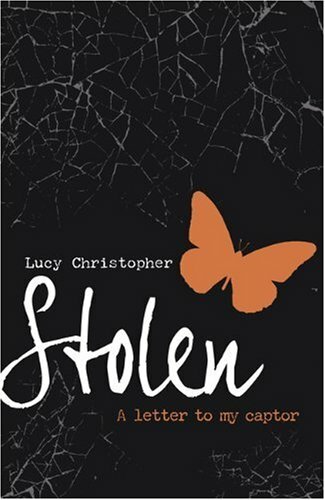 Easily one of the best books I've read this year: Stolen by Lucy Christopher. Stunning and scary and beautiful with the most crush-worthy of writing it messed with my head and completely spun me out. The synopsis? Basically, Ty kidnaps 16 year old UK girl Gemma from Thailand and takes her to his remote place in the Australian outback. Goodreads blurb quote: Ty, her captor, is no stereotype. He is young, fit and completely gorgeous. This book messed with my mind and made me question right and wrong and all the shades in between. The writing, holy guacamole, is so evocative that it seeps into you. So so much goodness to crush on. The setting was so rich: I felt the stifling heat and slipped right into the red earth with Gemma and Ty. The plot? It's psycholgical and twisty and I just had no idea what the ending would be or could be or even how I wanted it to end. I was so driven to see what would happen and it's been a long time since I've been so caught up in a story like that. The characters. Okay, hands down, Ty is a new fave literary guy for me. I cant even describe all the emotions he made me feel. Love , intrigue, pain, terror, sorrow, beauty and gratitude - he seriously is in a new dimension of his own reserved for the elitist of haunting and unique characters that make me ache in the most hard-core of ways. The ending. Ooooh, the ending. It killed me and gripped me and lingered with me for days. This book, is why I read. And, it just intimidated me as a writer on a whole new level of whoah. Link to read the first chapter. Obviously, 5 stars. Couldn't put it down and can't get it out of my head. And, totally rooting for it to win CBCA best book of the year. Winner announced in a few weeks :) Plus, it's nom'd for the Prime Minters Award (a prize including $100 000 cash). Will be released in 2011. Notice how calmly I am delivering that info? Kingdom of Cello #1 (currently untitled...) The first in a new trilogy. I can't wait to meet the boy who walks across the white, white, white, white fields. You can mark it as to-read on goodreads. Check out Jaclyn's trippy little website which features Cures For Writer's Block, and How To Write a Novel in 47 Easy Steps and some FAQ that are, frequently asked... I think her website is the best writer's website I've seen because it is so Jaclyn Moriarty and it will make you feel happy just being there. Why is everything so perfect today? Did you notice the way that guy was looking at you? Shall I put another log on the fire? The way I feel about Jaclyn's books? It's like, you just had to be there. Once you read her, you'll know what I mean. 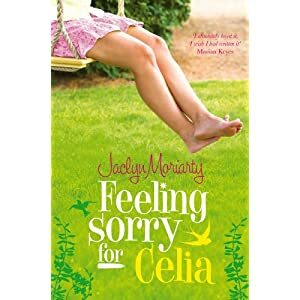 Anyway, today, I kept thinking about Elizabeth Clarry (from feeling Sorry for Celia) and I realised just how real her characters feel. Anyone else ever read about character that just feel real that you often find your mind wandering to them, as if thinking of an old friend and wondering how they are going? Is it just me, or does anyone else get tempted to buy their favourite books again when they are re-released with shiny new covers? I keep wanting to buy the new Aussie edition of Marchetta's On the Jellicoe Road. 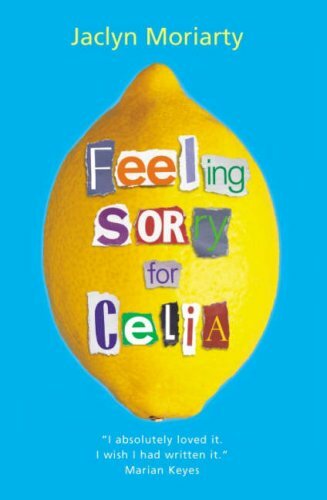 And, thoughts on the cover of Celia? Or anything at all you feel compelled to share with me today? Heist Society is like reading Ocean's Eleven but with a rag tag bunch of teens (including best friend hottie, glamour girl and geektastastic nerds). It's actually already been optioned for a film and I can see why. Not only is the plot intricate with a glamorous setting, but the writing is really a cut above. I loved the sophisticated tone and intelligent humour that amused me from the first chapter. Even with teenage protags, it doesn't necessarily have a YA feel about it. It's in third person POV, mostly from Kat, sometimes bordering on omniscient. Kat is the funkiest of main characters, spunky and determined, yet you see glimpses of insecurity that make her real and her motivations complex. In particular, I loved her dialogue. I wish I had connected to her a smidgen more though. Ally Carter knows how to keep the pace cracking with plot twists and clever foreshadowing. Add an eccentric but eeevil villain who continually ups the stakes and a puzzling and complex climax and you have an impressive book that it just plain fun. Oh! Oh! The covers? Which one's your fave? 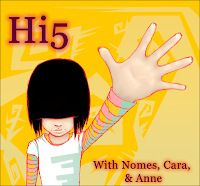 In which we feature our hi 5 picks for a different YA topic every Saturday and you join in with our Mister Linky doodad. This weeks topic: Any book title you just love like wow. I love the voice in this. I'm instantly a fan of the sky and the hills seem quite phlegmatic. There's a castle, and there's some capturing. And it's in present tense, which gives it a quirky little feel. Also, slightly whimsical. I want the castle. Seriously, best most evocative image-inducing title. And, then, when you realise its about a forest full of Zombies... OooOooh. Even my book shop lady had a little shiver over this one. This one gets you mad curious about the book based on the title alone. 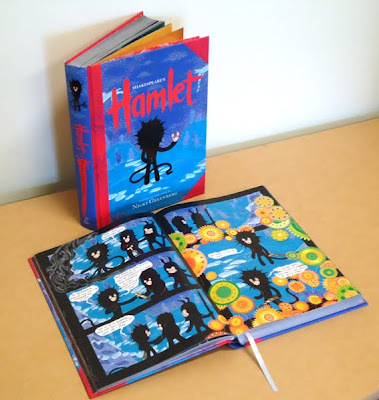 Author Michelle Hodgkin names a bunch of titles that make her drool in a nifty cool post. Cara from Chasing Words is 16, slightly cynical and all the way rockin' it out with the cool factor. 1. Last book you bought/ordered? Cara: I actually had a buying spree (Well, it was a spree to me.) and bought Linger, The Alchemyst, & The Secret Hour. Alright, so it's technically not a spree. Nomes: The Body Finder. Pre-order, paperback. Now, I’m suddenly noticing everyone raving and November feels like a crazy way away. 2. Favourite snack to eat while reading? Anne: Anything. I don’t typically eat while reading unless its a really good book. Cara: Anything within arm's reach that doesn't move when I poke it. Nomes: Chips are the ultimate. Chupa-chups, mmm. Never chocolate - too risky for the hallowed pages. Anne: When I was little, I loved Babar and Angelina Ballerina. Then I moved on to Magic Tree House, Junie B. Jones, etc. Nomes: My dad used to read Little Black Sambo to me like he was auditioning for an Academy award. I was a Blyton-aholic and tried to be cool by reading lots of TinTin around my big brother and his mates. Anne: Any Harry Potter. Or Percy Jackson... Or Beautiful Creatures. Or any other book I love. Cara: The Mortal Instruments series. I love the characters so much that I slip right back into the story every time. Also, The Sky is Everywhere. Nomes: Jaclyn Moriarty’s Finding Cassie Crazy (The Year of secret Assignments). It’s like a drug, that book. Cara: I’ll admit it, Jasper from Twilight. God he’s so angsty. Anne: Ninjas. You don’t even know they’re there until you’re dead! How awesome is that??!! Cara: Seriously. Ninjas are made of win, while pirates walk about making chainsaw noises. Nomes: Pirates. Ninja’s prance about in poncy outfits and their stealth has nothing on a swash-buckling treasure-hunting lifestyle. 2. Zombie Apocalypse or Alien Armageddon? Anne: Zombie Apocolypse. Aliens usually come in peace. Cara: Zombie Apocalypse! You could not have picked a more perfect question if you pulled it out of my head. I literally own a Zombie Apocalypse survival guide. It's gonna happen. Nomes: Zombieeeesss. I will create my own sisterhood. You can join me. Conditions apply. Nomes: Peeta sulks. Gale broods. Brooding wins out any day. Anne: I want both! Flight would be best, though. Nomes: Flight. Also, kinda wishing teleportation or time-travel was an option. 5. Rough it out camping or 5 star hotel? Anne: 5 star hotel all the way. Cara: I’d go Harry Potter camping. Ya know, where the tent is the size of a mansion? Nomes: Camping! There’s something about a campfire that makes even the stupidest conversations somehow noble and profound. And the meme? Each Saturday we'll be posting out top five YA picks for a specific topic. And, you guys can join in by posting your 5 picks and linking in with the Mr Linky. We'll let you know the upcoming weeks topic in advance. And tell me I have some fellow pirates out there? I'm digging it. It's from Melbourne author/illustrator/lawyer Nicki Greenberg, who sold her first series, The Digits, when she was fifteen (& sold more than 380,000 copies). Personally, I love illustrated book covers, especially ones by Jason Chan who is just whoah-talented. I have Katniss on mine, but it has the design on the left with the target frame and bullet holes. I think the target and bullet holes is only on the Aussie editions, so I think it has a slight edge over the UK. I like this cover, I think it's by far the best out of the three Australian editions for the series. This has a sense of urgency about it. I love the light and shade in the logo, pretty dynamic. This one looks a bit wobbly. Like the scene is made out of play-doh. I think the full moon and the font is meant to give it a slightly creepy sense of doom and foreboding. The green eye is just hypnotic. I keep staring at it. This looks like a paranormal creature gone wrong. Hiding in a dark dark giant cabbage. I love the Japanese. Characters are all video game avatars, LOL. I mean, check out Katniss', ah, assets! And Peeta! Savage warrior god FTW! I love this one. Katniss is my hero. And she's a hot little thing. She looks a bit like she's sinking into a watery grave or something? haha. So, which one has you chuckling gushing?